Santa was good to me this year. He delivered to me my very own MyVu Universal Edition. I got a chance to play around with one of these in a preproduction model this fall. My buddy Justin Nolan of PDALive.com got them to try and loaned them to me for a trip to the west coast. I own a 5th generation iPod video and having the option of watching them on the MyVu is easier on the eyes and just plain more fun. 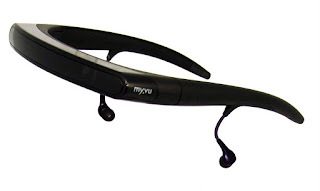 The MyVu is a personal viewing system that can connect to just about any video device out there. The images are bright, clean, and crisp. The unit I tried in the fall didn't have the best audio output, but I'm spoiled by my Bose noise canceling headphones and they cost about as much as the MyVu so I can't complain too much. I'll be giving it a try soon as I fly to the Dental Team Concepts meeting in Cancun. When purchasing these, make sure you know what you will want to connect to. My Universal Edition connects to lots of devices, but not some of the newer iPods. In that regard, I'm not really sure what "Universal" means. The good news is that if you need a cord to connect, you can buy it, but I would think the "Universal" edition would come with all of those cords. There are other versions that will connect to the newer iPods so perhaps that's what they are anticipating. This new unit also comes with its own rechargeable battery which is a feature I like. The other one I tried was powered from the iPod. Building a battery into the MyVu should allow me to get longer video playback from the iPod battery. The MyVu comes with a USB charging cable that you can connect to a computer, but it does not come with an AC adapter. The AC adapter would be a nice edition. I've got a few of those adapters around, so I can quickly charge mine off of AC power instead of the slower USB, but many purchasers may not be so lucky (or geeky). Overall I'm really happy with the quality of the MyVu and I'm looking forward to using it. Travel is just so much easier when you can watch James Bond. Well, I'm back. After the move to the new office and a bout with some bug that made me feel like I had a killer hangover for the past 3 days, I'm back to posting and (gratefully) living. As I type this, snow is falling outside and I've got patients to see in the new office this morning. Today's post is about a product I have yet to try, but it looks pretty cool. I'm not sure about disinfection in a dental environment, although you could probably polywrap it or bag it somehow. CRA (Clinical Research Associates) Foundation in Provo, Utah is changing its name to CR (Clinicians Report) Foundation effective January 1, 2008. In addition, its monthly clinical newsletter will be renamed the Gordon J. Christensen Clinicians Report. I'm not sure what this means at this point, but it's the first change of this type in quite some time from the organization. No in depth posting today as I'm up early to start the move to the new office. After 18 years at the old location (has it *really* been that long? ), I'm moving to a brand new free standing building. The new place is just shy of 4300 square feet with all the technology bells and whistles. I had been "making do" with the old place for the last several years and am thrilled to be moving in. I even went so far as to build a classroom so that events can be hosted here. Last night I spent an hour talking about technology information management on the Computer Outlook show. My thanks to host John Iasiuolo for having me on. We discussed handheld solutions in healthcare, why mobililty is important, and the security problems that face us as we move toward a totally electronic medical record. If you missed the broadcast, they are frequently put on line for streaming. Go to Computer Outlook for more details. Low on Juice in your iPod or iPhone? If so, you may want to consider the iPowerRush. This unique device uses 6AAA batteries and can provide power or a recharge. It gives 10 hours of playback time to iPods, 15 hours for the iPhone, and amazingly 120 hours of standby time for the iPhone. It also has a push button power indicator so you can tell how much juice is left in the device. This is one of those gadgets that could be a life saver when you're stuck in an airport and all the outlets have already been grabbed. 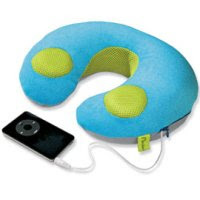 The price is $40 and it is available from the iPowerRush website. 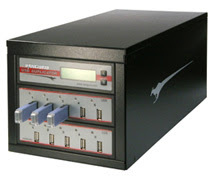 The photo above shows the Kanguru USB duplicator that handles 10 jump drives, but there is also a model that can handle 24. The company's idea for this is for IT departments to be able to make multiple copies of jumpdrives with needed programs for members of departments. It's the same idea as the multiple CD burning drives. My thought on this is that if you'd really like to have redundant off site backups or if you have multiple staff members who need to have the backup at their disposal due to rotating schedules etc this would make the process of creating multiple identical backups a pretty easy thing to do. Also if you are a vendor and want to seed the market with some jump drives containing your software, this is much easier than creating them one at a time. A pretty good idea being as I think that jump drives will be around for a long long time. Well, it's been a little over a week now since I switched over to YouMail and I've decided to stay with it. This service is a FREE voice mail service that saves your VMs online. You can listen to them on your phone or over the Internet. You can save VMs forever if you choose. My favorite part is that it makes use of caller ID. When I have a VM, YouMail sends me a text message and an e-mail as a reminder. Using caller ID, the service lets me know the number *and* the name of who called. This is a great service for when you get a call from an unknown number and you don't know if it's a wrong number, urgent, etc. You can also record custom greetings for friends and colleagues since caller ID will let YouMail know who they are. This is a great service that I highly recommend. It's one of the best things I've tried lately. After one week with the service, I'm hooked. AIBO - A Return Engagement? For those of you who have seen one of my lectures, I frequently show a picture of me posing with AIBO, Sony's robotic puppy. He was discontinued and sent to the big AI fire hydrant in the sky a few years ago and it was a sad day for me. At tech shows I would always find time to hang out in the Sony booth and watch the AIBO demos. It was a cool idea that was just a bit ahead of its time. However, there are now rumors afoot that AIBO's demise may have been greatly exaggerated. 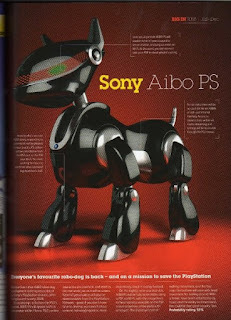 It seems that *maybe* AIBO will be back only this time he will interface with the PSP and PS3. Cool huh? I'm not sure how true this one is, but it's definitely worth mentioning here. AIBO is a geeks dream come true. Here is a nifty idea to help diabetic kids pay attention their blood sugar levels. The game, called GlucoBoy, is a game for the Nintendo Game Boy Advance that rewards kids for timely monitoring of their blood sugar levels. 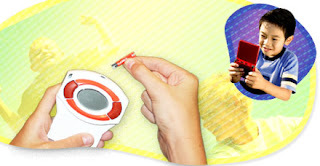 The game cartridge functions with or without the Game Boy as a glucometer, but plugging it into the Game Boy Advance means kids can earn points for timely monitoring and for keeping their levels within healthy limits. Points are scored and acquiring points unlocks game on the cartridge. A great idea to get kids more involved in their own health. Hopefully it will be available everywhere soon. One of our sister publications, Dental Lab Products has announced that the Cerec inLab unit was one of the most popular devices of the year. 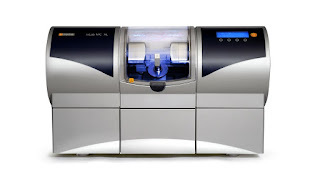 Charlotte, NC (December 13, 2007) – Sirona Dental Systems’ inLab® MCXL Milling Unit has been named one of 2007’s Top Ten Products by Dental Lab Products. The Top Ten Products were chosen based on the number of reader response inquiries for the product. Product profiles presented in the publication contain unique reader service numbers attached to each description in order for readers to request further information on the specific product of their choice. Sirona’s inLab MC XL received a substantial amount of reader response inquiries and interest when compared to other products. The second annual Top Ten Products list will be included in Dental Lab Products’ annual Buyer’s Guide, made available and distributed to dental professionals in the month of December. It will include a special highlight of all Top Ten Products, detailing the unique features and benefits of each product. To view the full list of Top Ten Products, please pick up December’s issue of Dental Lab Products, or visit www.dprworld.com. For more information on the inLab MC XL, please call 866-inLab4U, or logon to www.inLab.com. 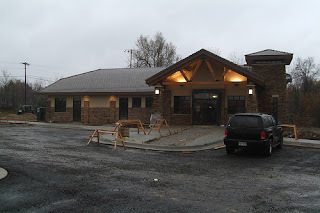 About Sirona Dental Systems, Inc. Recognized as a leading global manufacturer of technologically advanced, high quality dental equipment, Sirona has served equipment dealers and dentists worldwide for more than 125 years. Sirona develops, manufactures, and markets a complete line of dental products, including the CAD/CAM restoration equipment (CEREC), digital and film-based intra-oral, panoramic and cephalometric X-ray imaging systems, dental treatment centers and handpieces. 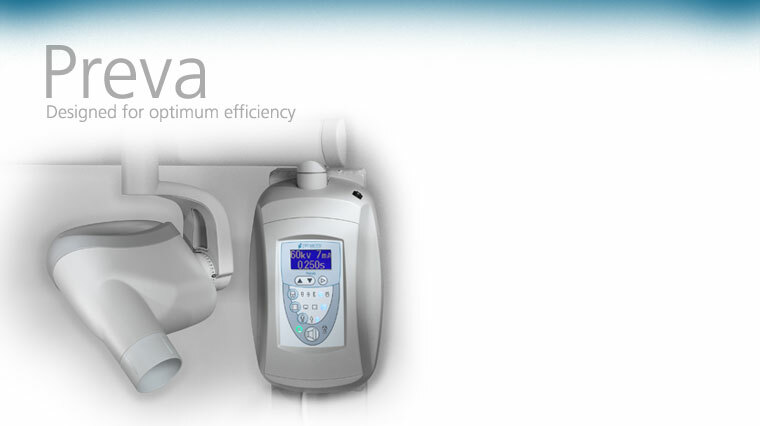 Visit http://www.sirona.com for more information about Sirona and its products. The inLab MC XL features a modern, elegant design with solid, heavy-duty construction. Milling performance and precision has been optimized to +/- 25 microns, which is even 20% better than the current inLab system. The tandem burs now spin at 60,000 RPM resulting in considerably faster milling times—approximately 6 minutes for a full-contour crown. The inLab MC XL can mill 40 to 60 units per day. The unit has 4 burs capable of milling the entire range of material blocks, so there is no need to change burs when changing materials. The inLab MC XL can also mill large-span bridges of up to 8 to 10 units. A large window at the front of the milling chamber allows better visualization of the milling process with color-visualized status indication: the milling chamber lights up in certain colors to keep the lab technician apprised of system status from anywhere in the room. The unit comes with a full 3-year warranty on all parts and labor. Dental Lab Products a sister publication to Dental Products Report, provides timely news on product developments that enhance dental laboratory operations and the production of laboratory fabricated restorations and appliances. If you've got an iPhone and need ePocrates or if you've been wanting an iPhone but have held off making the purchase because you use ePocrates and don't want to be without it, have I got good news for you! At this time, it’s not possible to download Epocrates software to an iPhone device. However, we’re pleased to announce that the free Epocrates Online web-based drug reference is now available in a format that's optimized for iPhone and iPod touch devices. Simply point your Safari browser to http://m.epocrates.com/iphone to access continually updated monographs for more than 3,300 drugs. "When I opened [it] and saw that it worked just like the iPhone, it actually made me smile!" "It is a beautiful site." Apple recently announced that in early 2008 software developers will be able to begin to create applications for iPhone devices. We are excited to explore the opportunity to offer our mobile products on this new platform. Attention Vista users (and you know who you are), the big boys in Redmond have got the first full update to the Vista operating system available for download. For Vista SP1 and all the download details, go to the Vista SP1 site. Anesthesia without any type of medication? A company called BioMeDevice Ltd has developed and received FDA approval for a device that basically provides anesthesia through the use of a compound that gets very cold. An interesting idea. Oral pain relief in seconds without drugs? The FDA says yes, recently certifying the first cryoanesthetic dental mouthpiece for the US OTC market. The new gumEase provides pain relief without the side effects or complications of drugs. It's a tempting solution for clinicians plagued with patient needle phobia, sharps and the complex issues of hypodermic delivery. Inserted easily into the upper and lower sulci, the latex-free device delivers a soothing, cool temperature to the maxillofacial nerves, quickly diminishing pain across a wide area of the mouth. In patient tests the new gumEase diminished pain by 90% in 2 to 3 minutes for the average participant. Patients can also apply them post-operatively as needed, and reuse without side effects by storing in a household freezer. "It gives dentists an option they didn't have before", says Tay McClellan, BioMeDevice CTO, "they can manage patient pain easily in a wider range of situations. Now it's not a problem to have a patient who can't use drug-based anesthesia." The device also holds promise for situations where needle use is limited; such as Brazil, whose interest in the gumEase is spurred by HIV initiatives there. The Class 2 gumEase G-100 is prepared by storing in a conventional freezer until freezing temperature is reached. 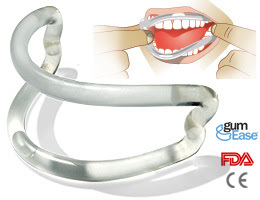 Proprietary solutions inside the mouthpiece prevent it from freezing, allowing it to form comfortably within the patient's mouth for several minutes. Pain reduction lasts for up to twenty minutes, and the process can be repeated as often as needed. Shaken, not stirred. Those words bring tears to the eyes of Bond fans like myself. What's not to love about James Bond? The guy has it all... good looks, cool job, the girls, and THE GADGETS!!! 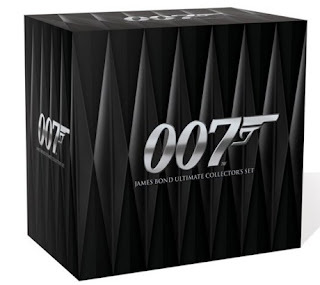 For a gadget guy like me, James Bond is my ultimate hero. I'm passing along a great deal I discovered this morning as I sit in my home office iced in from the freezing rain that has crippled the central U.S.
Could Sprint's Xohm service really change the way we use the Internet? For those of you who haven't heard, Sprint is about to roll out a service in 3 cities (Baltimore, Chicago, and Washington D.C.) called Xohm. It uses a technology called WiMax which is an always on wireless broadband. Popular Mechanics has a great article on the service and why it may well change the way Sprint is perceived *and* the way we use the Internet. Give it a look! Although it's currently just a rumor, I'm excited about the possibility. It seems that American Airlines may be getting ready to offer broadband wireless Internet connections on their fleet of 767-200s in 2008. The rumored service will be provided by Aircell, the same company that is providing Wi-Fi to Richard Branson's Virgin Atlantic Airlines. I'm hearing $10 for the access, but for someone like me, it's worth it. My only fear? Everyone firing up their laptops, logging into Skype, and yakking away into a headset. I'd prefer to keep the phone call stuff shut down as it is currently. I've begun experimenting with a web service called YouMail. The idea is pretty simple. YouMail gets your voice mail and then contacts you via SMS and/or e-mail. You can listen to the message from your phone, from the web, or you can set the service up to send you an audio file of the message when you receive the "you have voice mail" e-mail. The service allows you to actually SEE who has called and allows you to arrange and store your voicemails... forever if you'd like. You can also record *personal* greetings that are triggered by caller ID from numbers in your contact list. My wife gets one message, friends get their own, unknown numbers get my standard greeting. So far the service appears very slick. Oh... and did I mention that it's FREE? That's right no charge for all of this. That makes it really, really cool! For those of you who are less tech literate or don't have time to do all of your own IT, take a look at the press release below. Far Hills. NJ – December 06, 2007 - This year, many PC and laptop computers will be given as holiday gifts. However, most of these nice gifts will have something naughty inside that can seriously compromise their performance. It’s appropriately named junkware. Junkware is the trial software, games and so-called efficiency tools you didn’t ask for, but nonetheless came pre-loaded on your new PC or laptop. Computer manufacturers market junkware as free, extra-value programs. But in reality, they profit from companies who pay to have these programs bundled with new computers. While the computer manufacturers count the cash, you’re left to fend off the constant pop-ups reminding you to renew your expired trial software. There are ways to remove junkware. One way is to use a multitude of system cleaning tools. One leading computer magazine recommended 20 different tools to do the complete job; but this is can be complicated and time consuming. A computer consultant or the service department at your computer store can do the job as well but for a hefty fee. Clean Machine will be offering a superior alternative globally in January when it launches its unique and powerful PC Concierge Service, which for $19.95 a month assigns a highly trained technician to remotely scan your PC or laptop to effectively remove virtually all junkware, spyware and viruses. The PC Concierge Service technician is armed with an extensive arsenal of the latest system optimization and security tools. Clean Machine also provides the customer with the most secure environment. It is more secure than onsite or other remote access solutions, including, for example, those offered by Geek Squad. The company has a unique, patent pending, 5 stage security process based on their proprietary software and processes. The PC Concierge Service is also the perfect system optimization and security solution for small businesses of 5-10 computers, such as dental practices which generally don’t have a dedicated IT staff. Clean Machine's remote PC support offers a very cost effective solution for supporting a dental practice’s critical business systems and avoiding downtime that can severely impact their bottom line. The powered or "electric toothbrush" continues to evolve and improve. The latest effort from Crest and Oral-B is an example of this continued evolution. Called the Oral-B Triumph with SmartGuide, it takes the idea of brushing feedback to a whole new level. 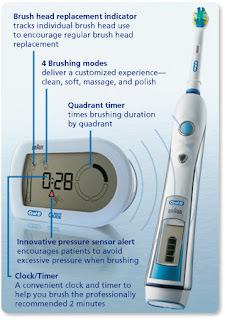 The brush comes with a wireless "SmartGuide" display unit that shows the patient what quadrant they should be brushing, the amount of time elapsed, a brush head replacement indicator, and a pressure sensor alert which advises the user when they are applying too much pressure during brushing. This is the first brush I've seen that provides *visual* feedback for the user. A very innovative approach. This dual monitor setup from Korea allows placement of the monitors in almost any position you can imagine i.e. stacked, side by side, etc. This setup would be great in a personal office or in a conference room/ consult room. It would help keep your dual monitor setup efficient in your personal office while also allow someone watching a mirrored monitor setup to be able to see your monitor no matter where they are in the room. If you are using a digital SLR camera in your office, chances are your staff has a certain fear of touching it. Sometimes this can be because using one of these cameras can be a bit complicated and intimidating. However, the other reason can be a more simple one... no one wants to damage such an expensive piece of equipment. To the rescue comes Camera Armor. 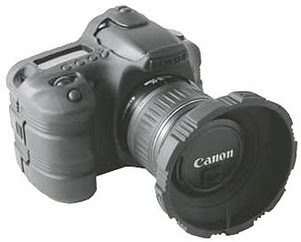 This unique product features a silicon rubber casing that fits around the camera to protect it from bumps and scratches. It even includes a polycarbonate shield for the LCD. It is made specific to popular camera models so that all controls are accessible. Price is around $60. 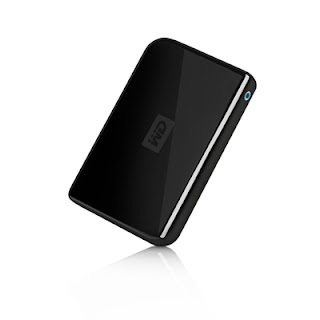 Western Digital, one of the world's leading hard drive manufacturers, has released another version to their popular Passport line of portable hard drives. The newest member of the family features a 320GB hard drive. I love this particular type of portable hard drive. They are small (roughly the height and width of a small paperback book) and incredibly light (about 5 ounces). One of the very best things is they receive their power direct from the USB connection so there is no need to carry a power adapter. Simroid, a robotic dental patient with an eerily realistic appearance, has been spotted at the 2007 International Robot Exhibition in Tokyo. Designed primarily as a training tool for dentists, the fembot patient can follow spoken instructions, closely monitor a dentist’s performance during mock treatments, and react in a human-like way to mouth pain. Because Simroid’s realistic appearance and behavior motivate people to treat her like a human being, as opposed to an object, she helps dental trainees learn how to better communicate with patients. Kokoro says that for an extra touch of realism, Simroid exhibits a gag reflex when instruments are inserted too far into her mouth. As I've gone through the process of designing and building a new office from the ground up I've learned a few things. One of those things was to expect the unexpected problem. Most problems can be anticipated and avoided with proper planning (and I AM a planner), but you can't think of everything. So it was on Friday as I watched the technicians from Goetze dental assemble my European Design cabinetry in the clinical suite. "Hey Dr. Flucke," one of techs called, "we've got a problem." Now this was the first problem we've encountered in the dental install so I wasn't sure what it would be. I made the decision not to move much of my existing equipment and to go almost totally with new. However, I had 2 fairly new intraoral x-ray units and those I had decided to install in the new location. Well it turns out that one of those units will not fit in the new cabinetry. Since I would need more than these 2 older machines, I had purchased a Progeny Preva to use as the x-ray unit in my principle treatment area. The Progeny unit had already been installed and, of course, it fit in the cabinet with no trouble whatsoever. My long term plan had been to get rid of the unit that wouldn't fit and replace it with a Progeny some time in 08, but now what was I going to do? This is where the story of Progeny and their customer service comes into play. A call was placed to my local Progeny rep explaining the dilemma that Goetze was dealing with. She gracefully and generously got me a loaner unit to get me by. The Progeny equipment is state of the art and I highly recommend it based on the quality of the equipment alone. However, when you combine that kind of quality with this kind of customer service, how you buy from anyone else?